What will go on in "The Center"? A new town is being built in New Mexico. It will have no people, no government, and no workers. Supposedly it's there to test out environmental technologies, but truly, it is there to provide a rich ground for future conspiracy theories. Welcome to The Center. A Washington DC company, Pegasus-Global Holdings, is probably looking to cash in on the (hopefully long-lived) trend in environmentally-friendly energy research. Anyone who comes up with a new idea about how to power a town, efficiently run a transportation system, or investigate household-owned renewable energy systems will need a place to test out their inventions. This place may be very useful for society and profitable for the company that makes it, but it will prove a real boon for budding mid-level conspiracy-fiction writers. There are plenty of ways this new project meets all the criteria needed for paranoid fantasy. First of all, location, location, location. This place will be built in New Mexico, of Roswell and Los Alamos fame. Secondly, there's the expenditure of significant amounts of money, in this case about 200 million dollars, for a nebulous goal. Sure, there might be plenty of energy firms, government agencies, and nonprofits that will use the service, but are they truly covering all the costs or is it an evil scheme? And then there's always the lure of the ghost town. 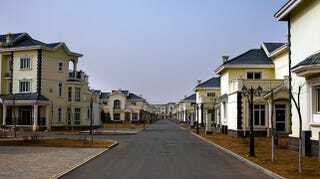 The testing facility will have the homes, office blocks, and retail areas of a town of 35,000 people. All that property, just standing empty. Anything could happen there. Of course, Pegasus-Global Holdings, isn't helping themselves when it comes to the name, either. This town to be built for shadowy experiments in the middle of the desert shall be called, The Center. The phrase, "Welcome to The Center," can only be said by Professor X or by someone stroking a white cat in a James Bond movie. That being said, I wonder if they can get people to stay in those houses. Sure, the residents would be part of a series of experiments, performed by anyone who could afford to rent The Center. But free rent is free rent.